Construction site for Domani. Photo via Builder Online. 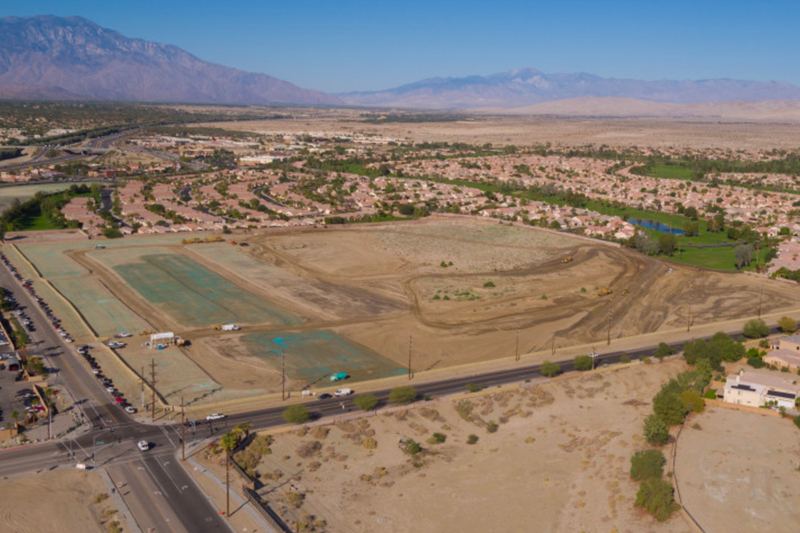 Development is underway for the new Palm Desert active adult community called Domani. The developer, The Rilington Group, broke ground late last year to begin the site’s infrastructure and the developer plans to begin construction on the model homes and clubhouse in June. The five new model homes will be open for tours to the public by November of this year. Domani will be a new, gated 55-plus community that will host 202 single-family homes, which will be priced from the high $200s. There will be five Early California-style floor plans offered that will range in size from approximately 1,586 to 1,893 square feet. Some of the interior home features include granite countertops and maple cabinets, while the exterior of the home will include courtyards and backyard areas. In addition to the new home designs, Domani will also offer residents amenities such as a clubhouse, fitness center, outdoor pool, nature trail, and bocce ball and pickleball courts. The active adult community will be located in the Coachella Valley, which is thought of by industry experts as a prime retirement hotspot that hopes to attract retirees from large urban areas like Los Angeles, Orange County, and San Diego.